This Paderno World Cuisine cylindrical device has a sharp interior ring that slices into the vegetable when pressed down. 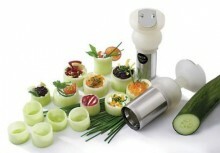 It creates hollowed-out cylinders of vegetables perfect for filling and decorating. It comes with a 2 inch diameter for most cucumbers and zucchinis. Click the button below to add the Paderno World Cuisine Cylinder Cutter 2 inches diameter to your wish list.